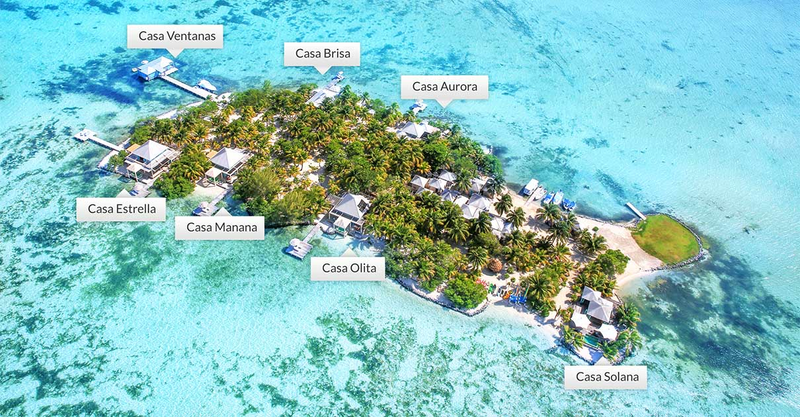 The layout of Casa Aurora allows you to relax without boundaries. This comfortable villa is perfect for that romantic getaway and has a large private plunge pool (the largest on the island), and fantastic morning views from your private dock. Guests can enjoy serene moments in a hammock, or bundle up in the king beds, covered in Yves De Lormes sheets. Enjoy Caribbean ocean side bedrooms, with sleek baths and personal decks and private dock. The center of Casa Aurora has a living room with a butler’s pantry that opens to the deck and covered pool area. This feature leads to a two-level deck, which connects your living area with your infinity plunge pool, private dock and beach areas. This is one of the best aspects of Casa Aurora. During the day your Houseman can move your living room outdoors, poolside. This is truly one of the best spots on the island. Casa Aurora is adorned with exotic hardwood furniture and does have the capability of sleeping four guests if you need a little extra room. This is the island owners favorite house! Two bedroom (2,100+ square feet).